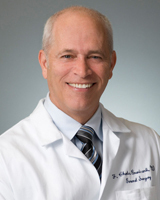 Background: F. Charles Brunicardi, MD, previously served as a professor, and chairperson of the Michael E. DeBakey Department of Surgery at the Baylor College of Medicine in Houston where they implemented Epic in 2010. He returned to the UCLA Health System and David Geffen School of Medicine in July and looks forward to the implementation of CareConnect here at UCLA. You have several years of experience using Epic. What do you like best about the system? I liked the ability for doctors to communicate with one another through the system to improve patient care. Everything is in one place -- you don’t have to switch between multiple systems to find information. It also has MyChart, which my patients all loved and made it easier to communicate directly with my patients. They could refill prescriptions, view test results, and ask questions through the MyChart function, and I could get their requests right away through the system. Do you miss using Epic since we don’t have it in place here at UCLA? Yes. I had to learn a new system when I came to UCLA, which is a combination of paper charts and an electronic medical record called Centricity. The system was new to me and it wasn’t difficult to learn to do things partially in the paper charts and the rest in the EMR, but I would definitely prefer to be using Epic again –- where everything is in one place. How do you expect CareConnect will be better than the systems currently in place here at UCLA? I’ve used Centricity and I far prefer Epic. The service for Epic is outstanding –- and it’s simply easier to use. With CareConnect, you’ll have a single electronic record for all patients in the UCLA Health System -- that’s what I’ll enjoy the most. You don’t have to answer all the same questions over and over again, and everything is online. What can we do to make sure we're ready? Physicians will need to be trained on how to use it, and they will also need to be patient. When one learns any new system, it takes time to become more comfortable with it. As soon as one learns how to use it, they will see that it will save time and is straightforward to use. In your experience, what sort of concerns did you hear about Epic when it was implemented at Baylor? What were you hearing from your colleagues? At Baylor, doctors were concerned Epic would create more work for them and slow them down. In my experience, it made my clinic much more efficient -- and to be honest -- that came as a pleasant surprise to me. What advice would you give to your colleagues here at UCLA about CareConnect? Just like any other electronic system, one has to be patient and be willing to learn how to use it. If one takes the time to learn how to use it, they will find that their efficiency will increase over time. Anything else? It is wonderful that UCLA is implementing CareConnect. The use of an electronic health record such as CareConnect will bring the UCLA Health System to the next level of excellence. The EHR is a critical component of an accountable-care organization, which will be essential for the best health care systems to compete in this first part of the 21st century.